The last event of the spring schedule on the 2017 Trail was the IMTT Gregg Tichacek Memorial Tournament on Lake McMaster in the SnakeDen Hollow SFWA near Victoria IL. Lake McMaster covers over 160 surface acres and reaches depths of more than 60 feet. Deep standing timber, shallow flats and defined weed lines provide an excellent environment for Muskies to thrive. 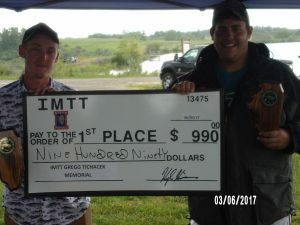 36 anglers from Illinois, Indiana, Missouri and Wisconsin made up the 19 teams facing air temperatures in the mid to upper 80s, high skies, very light winds and clear to gin clear water competing in the one day event. 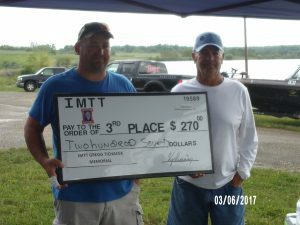 At the end of the day there were 3 Muskies registered over the 30″ minimum required to qualify for points. Several Muskies under 30″ were also reported which gives the impression that Lake McMaster Muskies will be around for a long time to come. In First Place was Jared Goyke (43.75″) of Schaumburg IL & Marc DiMatteo also of Schaumburg IL. Second Place went to Taylor Parkhurst (40.25″) of Dunlap IL & Jared Gibbs of Chillicothe IL. Third Place went to the father/son team of Garry C Handlin (40″) of Rosedale IN & Garry W. Handlin of Brazil IN. 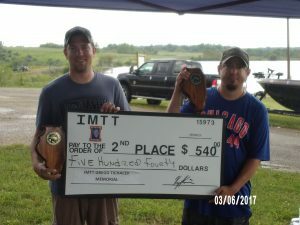 Next on the IMTT schedule will be the Mike Sule Memorial Tournament at the Fox Chain of Lakes near Antioch IL on September 9th 2017. Contact John Kliczko at: 630-981-4344 or metromusky@aol.com for details.